Some of my colleagues are surprised I don’t use NetBeans or Eclipse or some other fat IDE. In fact, I believe the most powerful IDE is UNIX. I also acknowledge that fine-tuning all your UNIX tools to your exact requirements can be cumbersome. But you don’t need to customize everything from scratch. Open source is great because you can steal what other people are sharing and put it altogether as you like. 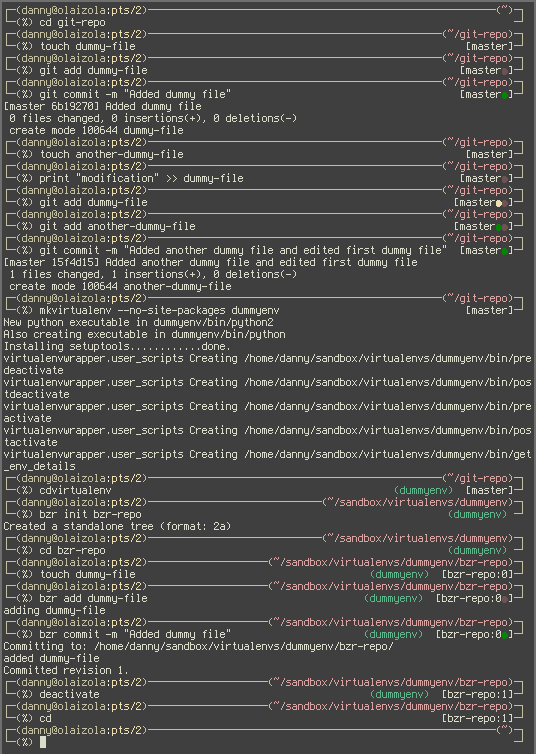 Lately I have been reading some great posts about customization ZSH. I consider the shell prompt a fundamental part of the UNIX IDE. In the screenshot below I show how my customized ZSH prompt plays nicely with bzr, git and virtualenvwrapper. bzr prompt hack: from scratch imitating git hack. In another blog post I’ll write about my customizations for Vim, urxvt and awesomewm to reach the ultimate UNIX IDE.